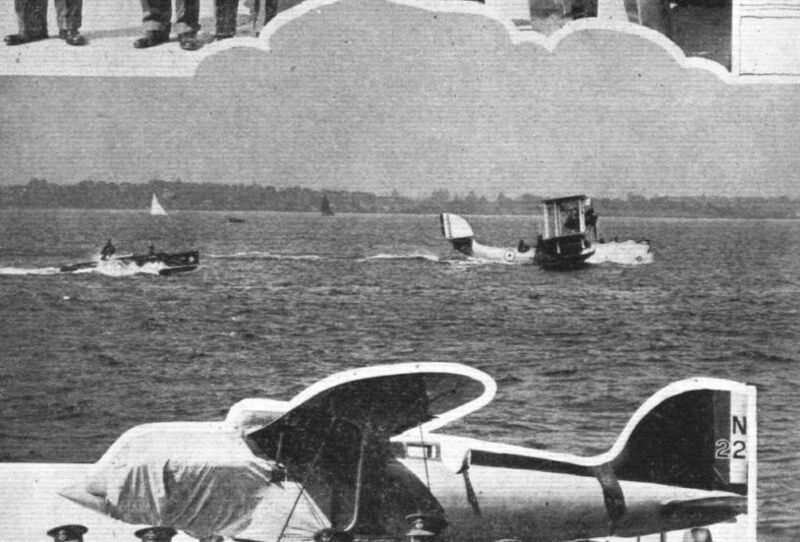 "ALSO FLEW": THE RESERVE STANDARD "HAWK" SEAPLANE (500 H.P. CURTISS D.12) ON WHICH LIEUT. TOMLINSON, U.S. NAVY, SECURED FOURTH PLACE WITH 137 M.P.H.! 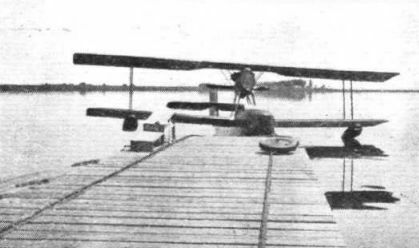 THE NIEUPORT MONOPLANE: TWO OF THESE SEAPLANES TOOK PART IN THE 1913 SCHNEIDER CONTEST, ONE PILOTED BY DR. ESPANET (FRANCE), AND THE OTHER BY C. T. WEYMANN (U.S.A.). 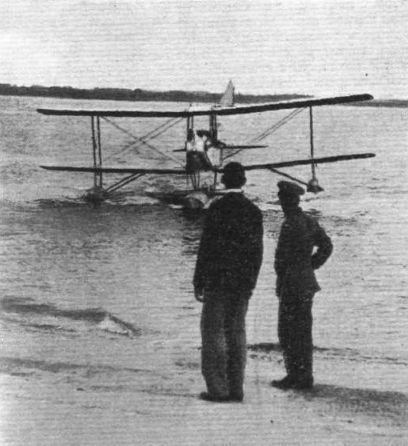 One of types of seaplanes, which took part in the seaplane meeting at La Baule. 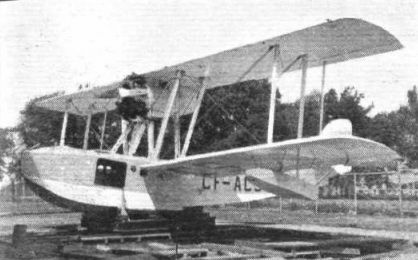 The French Navy also sent some Farman ''Goliath" (168) bombers, fitted with two 480 h.p. "Jupiter" engines, one of which is shown here. LIEUT. CUDDIHY'S CURTISS R.3C.4 RACER, 700 H.P. 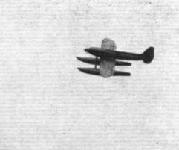 CURTISS V.1550, WHICH WAS NOT FAR BEHIND THE WINNER UNTIL FORCED DOWN ON THE LAST LAP. AMERICA'S FIRST WIN: LIEUT. 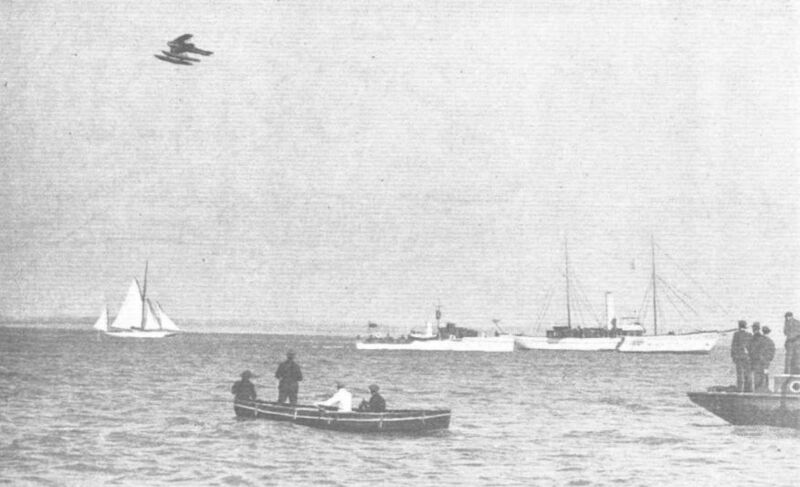 RITTENHOUSE, ON THE NAVY-CURTISS RACER, WINNING THE SCHNEIDER TROPHY AT COWES, 1923, WITH A SPEED OF 177-38 M.P.H. Siskin manoeuvrings: The R.A.F. 's part in the meeting. A Canadian Commemoration: To commemorate the tenth anniversary of the first transatlantic flight by Alcock and Brown, the Royal Canadian Air force marked the occasion at the annual Inspection of the Military Units at Camp Borden, Ont., by christening two of the latest Armstrong-Whitworth Siskin IIIA machines (Armstrong-Siddeley supercharged "Jaguars"). They were christened, by the Hon. Brig.-Gen. A. H. Bell, C.M.G., D.S.O., "Sir John Alcock" and "Sir Arthur Whitten Brown." Mr. Geoffrey de Havilland, Jr., adds a few more hours to EBTD's score. 1,000 HOURS BETWEEN OVERHAULS: A few years ago this would have appeared out of the question. 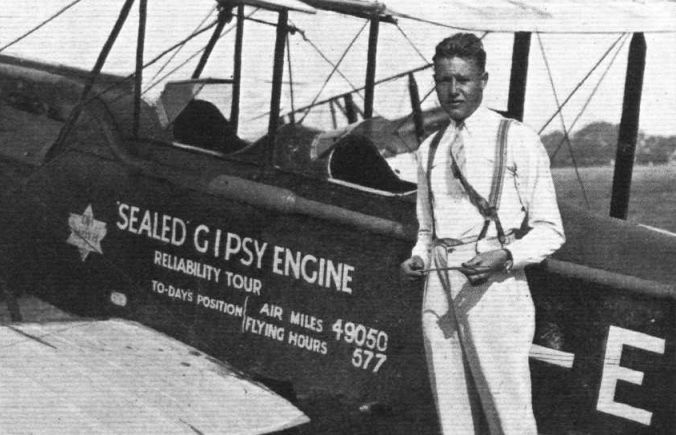 Yet the de Havilland "Gipsy" engine, in a "Moth," has just completed 600 hours, so that we are well on the way. One of these photographs shows, Mr. Eadon, who has sat behind the "Gipsy" during a large proportion of the 600 hours, is seen chalking up the final "hourage." Interested onlookers are Mr. Tuck, of the Hoyt Metal Co., who is interested in the bearings, Mr. Collins, an apprentice who has had much to do with the reliability test, and, on the right, G. de Havilland, Jun., one of several pilots who have helped to pile up a mileage of well over 50,000 miles. The "Gipsy" will now be put on the test bench to have power curves taken, and will then be stripped for examination. "THE MASTER AND HIS MINIONS": Capt. 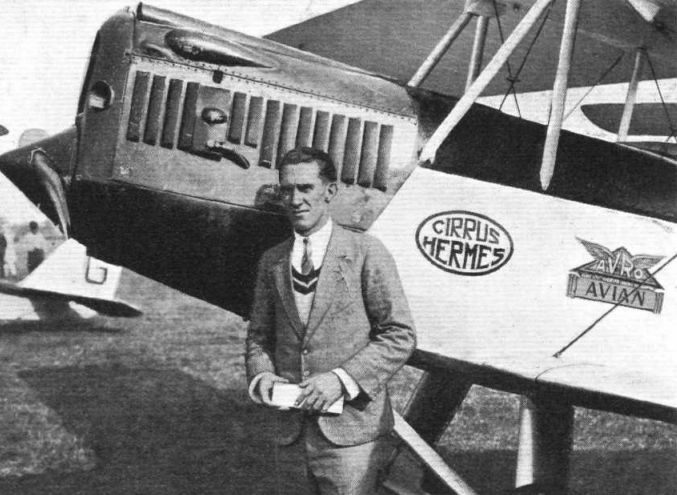 T. Neville Stack, A.F.C., Chief Pilot and Air Superintendent, on the left in the Hermes Moth and on the right his pilots show the result of his organisation. 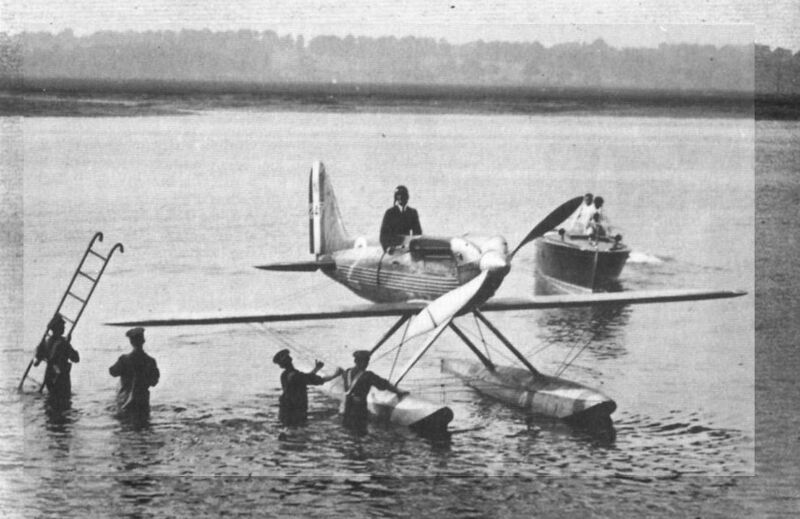 One of types of seaplanes, which took part in the seaplane meeting at La Baule. 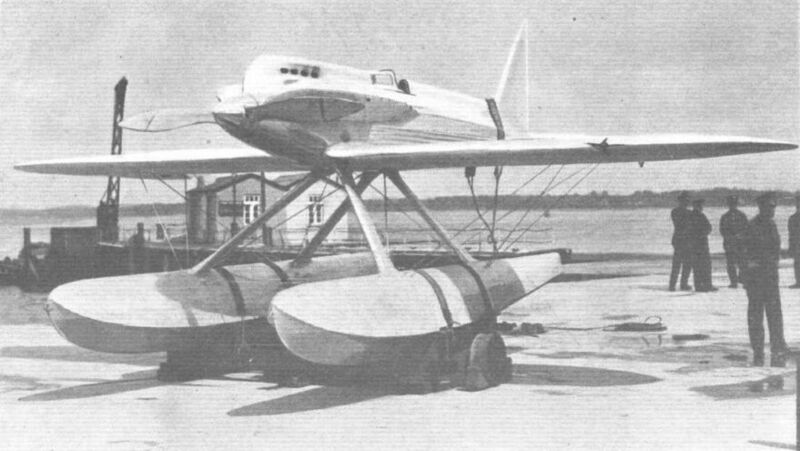 The C.A.M.S.37 flying boat, powered with a 450 h.p. 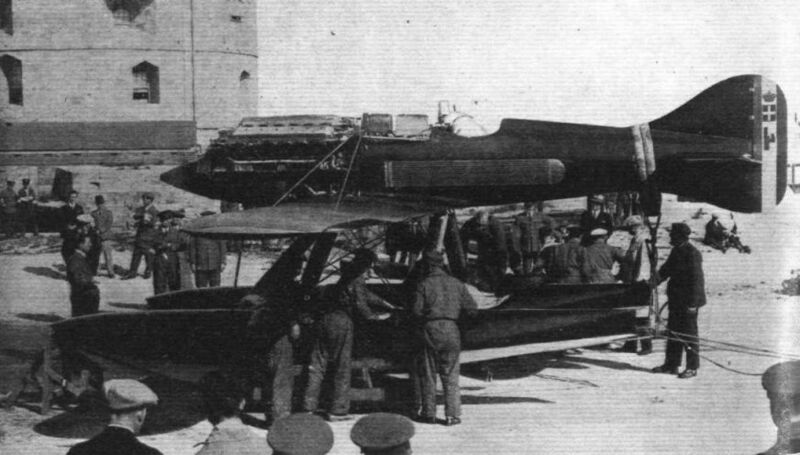 Lorraine-Dietrich engine; several of these were entered by the French Navy. 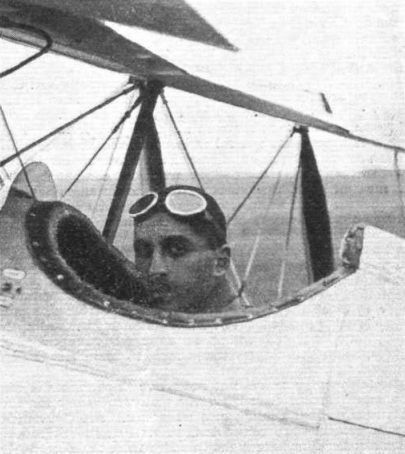 MAJ. DE BERNARDI'S MACCHI M.39 MONOPLANE, WITH 800 H.P. FIAT, ON WHICH HE WON THE TROPHY FROM AMERICA AT HAMPTON ROADS, 1926. HIS SPEED WAS 246-496 M.P.H. 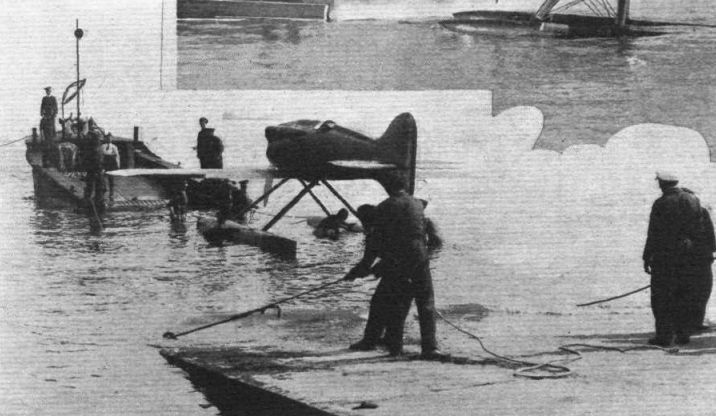 NAVIGABILITY TESTS COMPLETED: Dal Molin, on Macchi M.52, being towed to his buoy for the 6 hours' watertightness test. 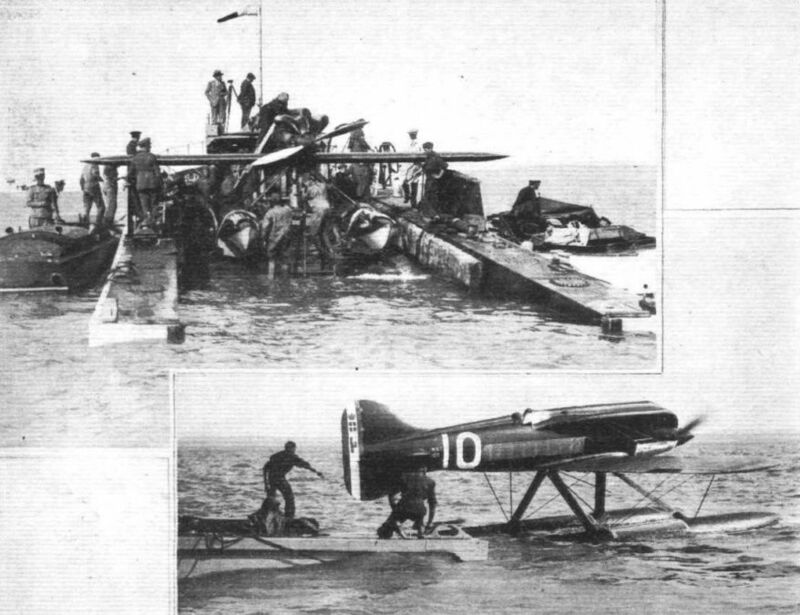 ITALIAN COMPETITORS: The Macchi M.52 being beached after damaging a float. 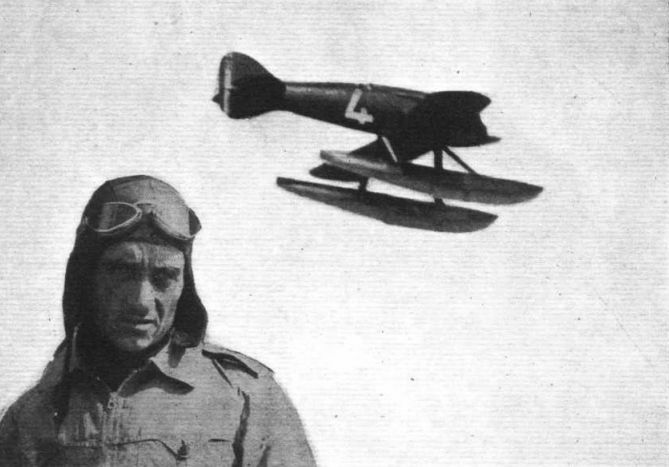 A "Sticker": Warrant Officer Dal Molin was the only Italian competitor to complete the course, piloting a 1927 Macchi M.52. His average speed for the course was 284-2 m.p.h. 18 CYLINDERS AND HOW MANY H.P.? 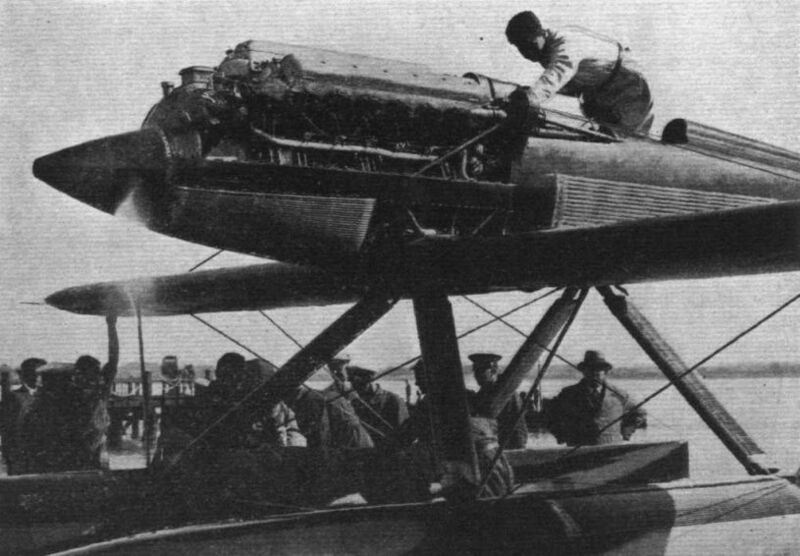 The Isotta-Fraschini engine in the Macchi M.67 s is of the "Broad arrow" type, with 6 cylinders in each bank. 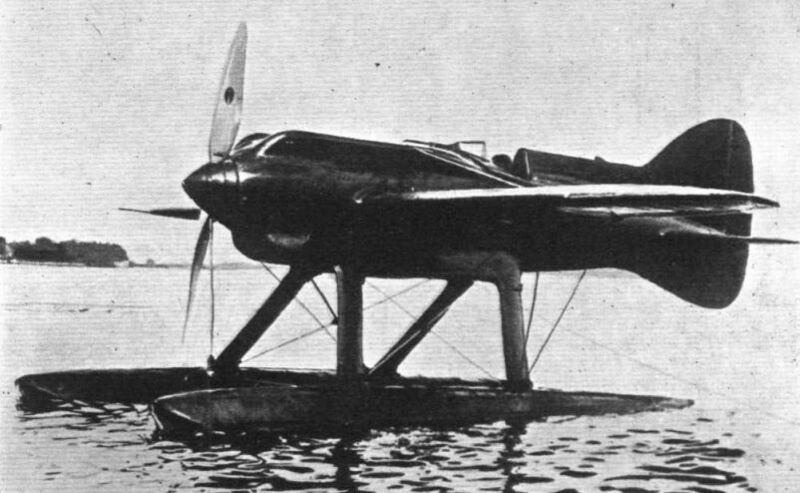 A FORMIDABLE CHALLENGER The Macchi M.67 is fitted with an 18-cylinder, broad-arrow type Isotta-Fraschini engine. THE PRELIMINARIES: The Macchi M.67, No. 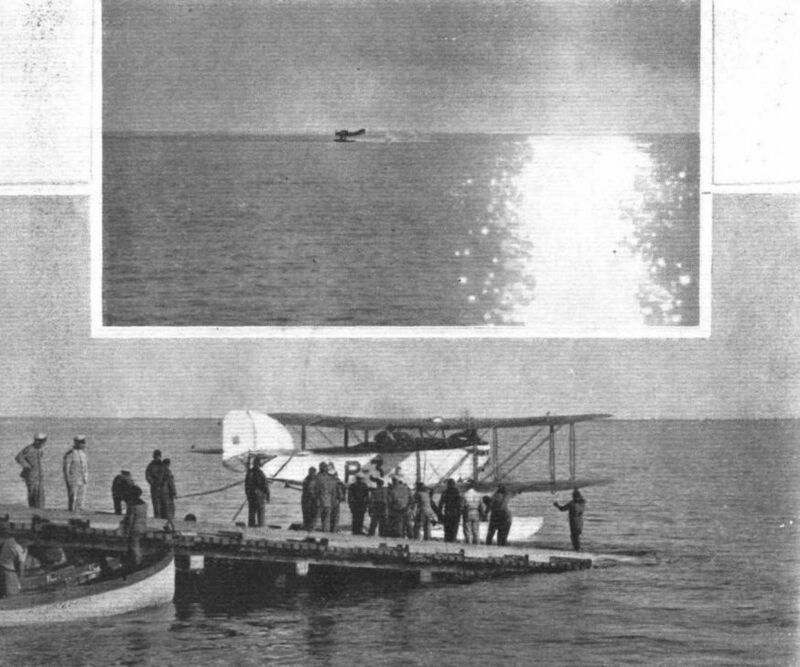 10, piloted in the Contest by Monti, on the pontoon and, in the lower picture, departing for its navigability trials. Above General Balbo, Italian Under Secretary for Air, may be seen directing operations. 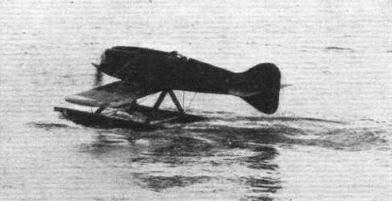 NAVIGABILITY TRIALS: The Macchi type M.67 (No. 7) with three-bladed airscrew taxying and landing. In the event only one Italian entry was to complete the requisite seven laps. 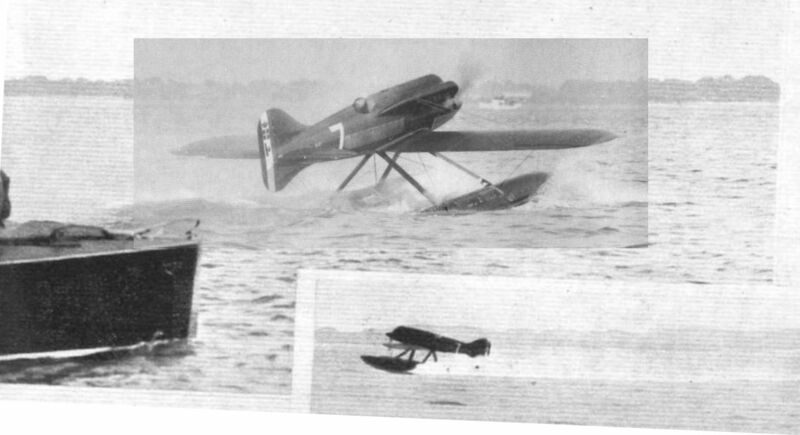 "NOT LESS THAN 12 KNOTS": Monti’s Macchi M.67, No 10, taxiing in amidst a halo of spray during navigability trials in the Solent. 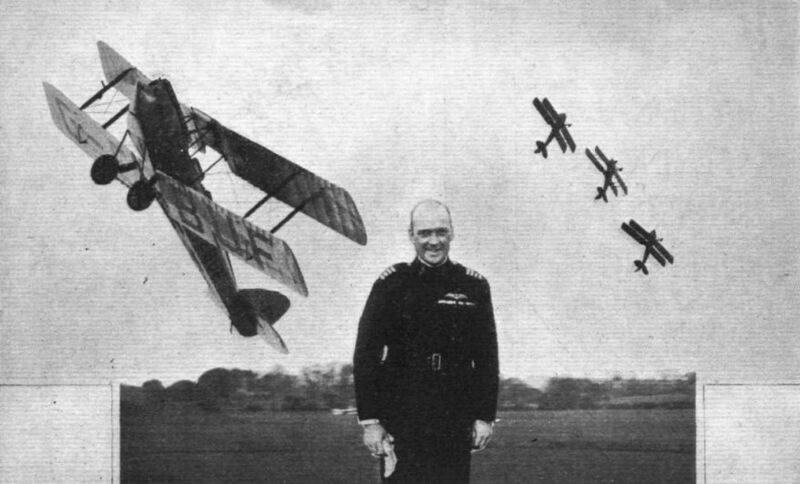 TWO GALLANT BUT UNFORTUNATE CHALLENGERS: Flying Officer Cadringher (left) and Lieutenant Monti both had to retire, the former owing to exhaust fumes and the latter with a broken water pipe. Monti was scalded rather badly by the hot water. A SCHNEIDER INCIDENT: Lieut. 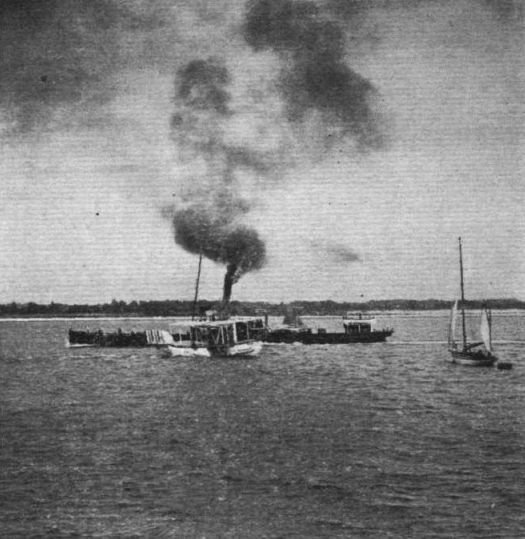 Monti, one of the Italian Schneider competitors, who was forced down off Hayling Island, was "salved" by a Royal Navy pinnace, and later handed over to the care of the R.A.F. launch. Our picture shows the latter taking the Macchi 67 in tow, while Lieut. 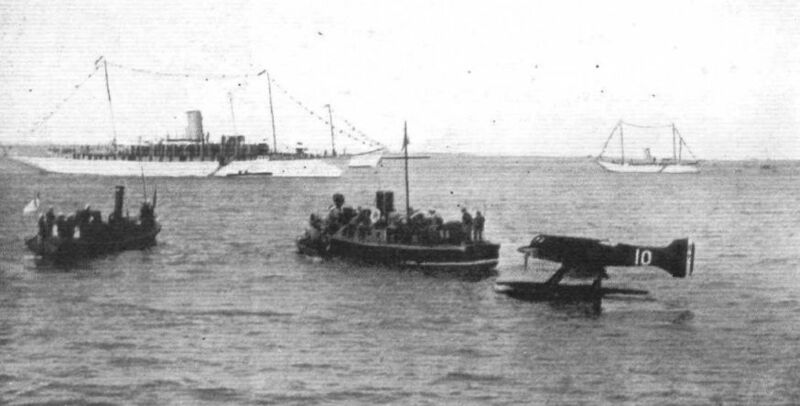 Monti goes aboard and the steam pinnace, on the extreme left, proceeds on its way. 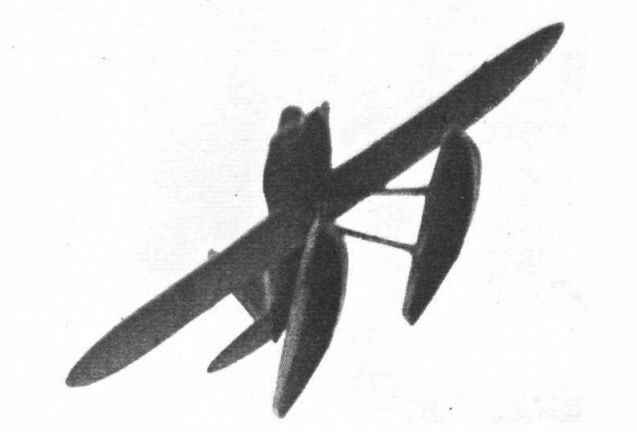 ITALIAN COMPETITORS: The Macchi M.67 (No. 7) coming in after a test flight. 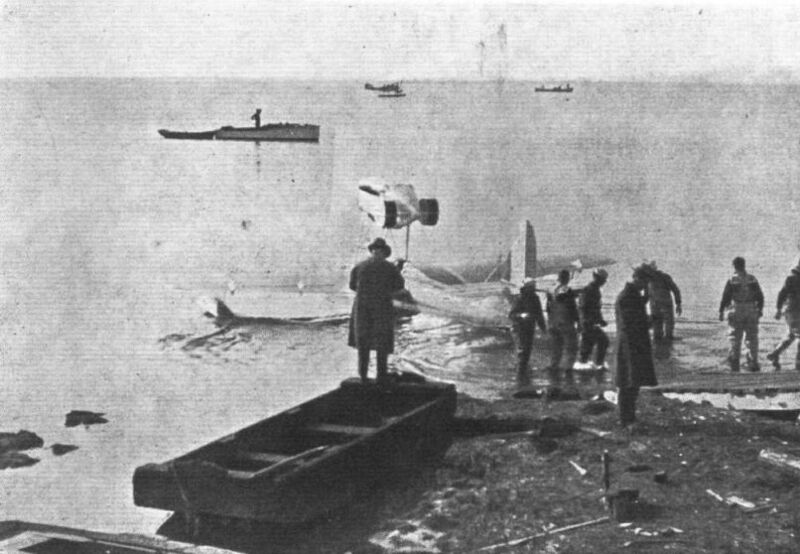 'Plane operating for fur trading port. This Fokker made the first Western Canada Airway Air-mail flight, Fort McMurray to Fort Simpson, January 23, 1929. 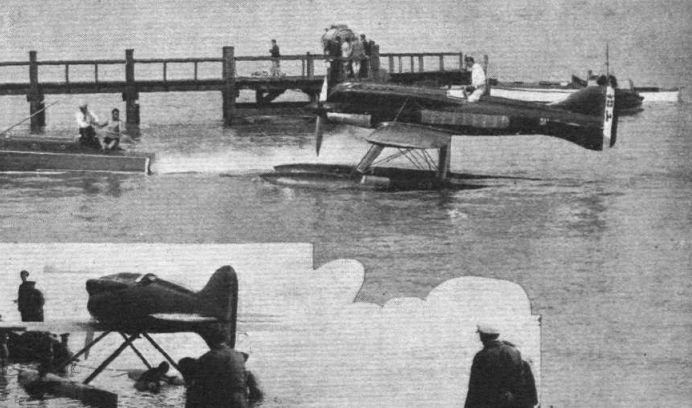 One of types of seaplanes, which took part in the seaplane meeting at La Baule. 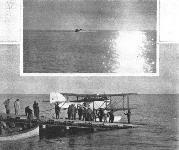 The machine is the Schreck F.B.A.Flying Boat. 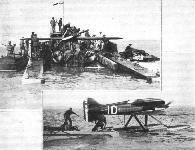 One of the two competing machines in the 1914 Schneider Cup Contest: M. Burri's Franco-British flying-boat. 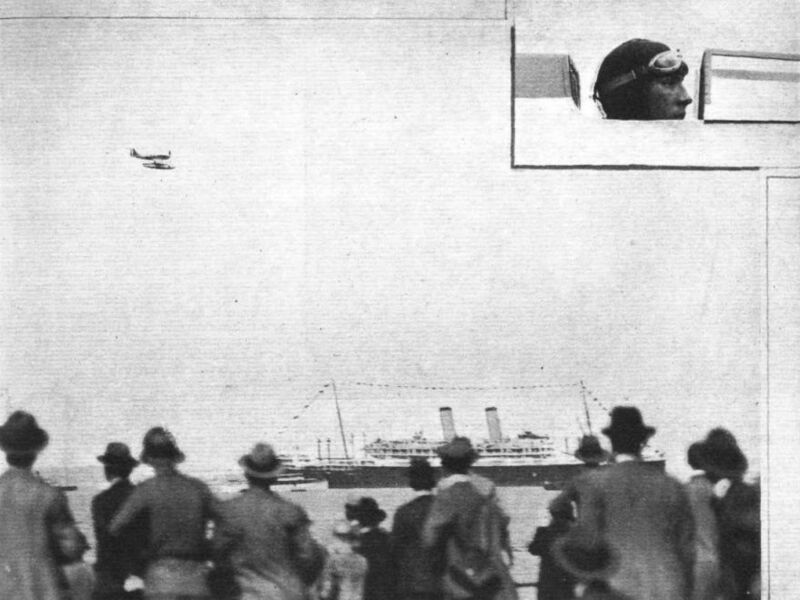 AT BOURNEMOUTH: THIS VIEW SHOWS THE ONE OF FOUR COMPETITORS IN THE 1919 CONTEST STARTING OFF THE PIER. 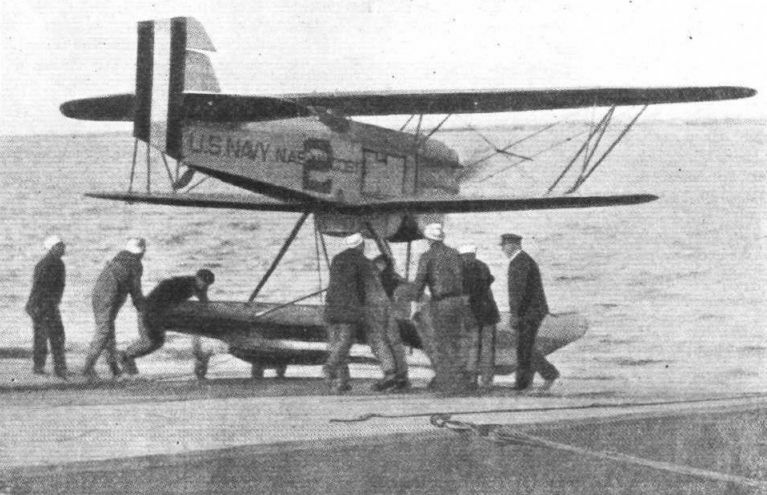 HOBBS ON THE SUPERMARINE "SEA LION" FLYING-BOAT. 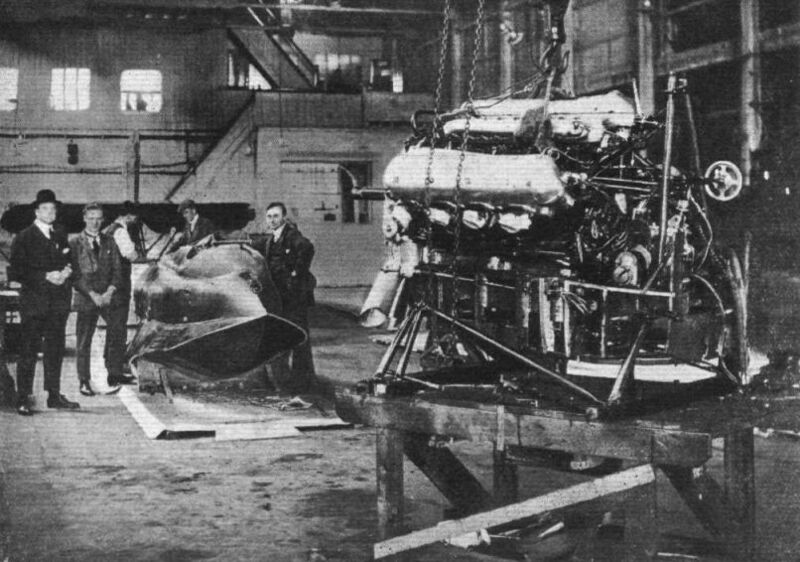 PREPARING THE VICTOR: THE HULL OF THE SUPERMARINE "SEA LION" FLYING-BOAT, AND THE NAPIER "LION" ENGINE READY FOR INSTALLATION AT THE SUPERMARINE WORKS AT SOUTHAMPTON. 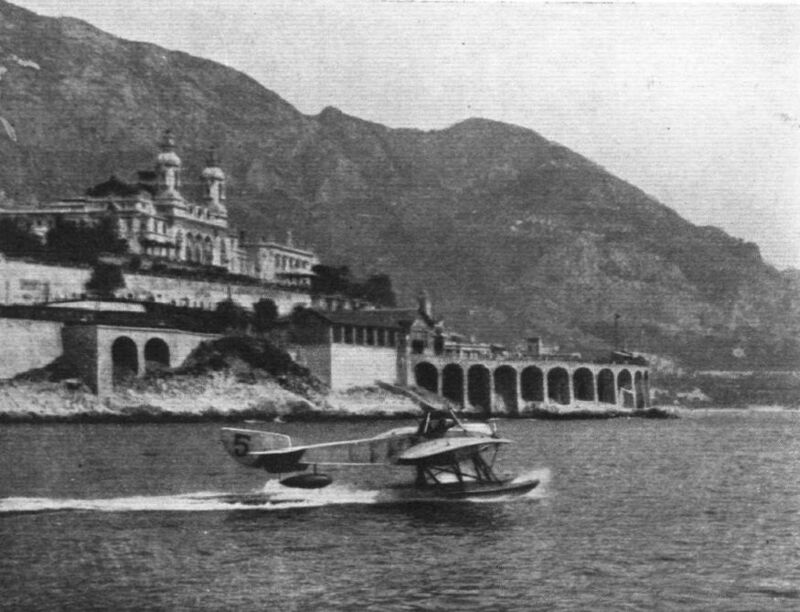 Для гонок на Кубок Шнейдера 1923 года в Англии был реконструирован Supermarine Sea Lion II с двигателем Lion 525 л.с. (391 кВт), новыми поплавками и фюзеляжем обтекаемой формы. Его обошли американские машины Curtiss CR-3. Драма в Неаполе - гонки на Кубок Шнейдера. 12 августа 1922г. : если бы Италия выиграла 6-е гонки на Кубок Шнейдера, то приз остался бы у нее навсегда. После предварительных соревнований Франция отозвала две свои летающие лодки CAMS 36, так что остались только британец Генри Биард на Supermarine Sealion II (G-EBAH, фото) и итальянская команда в составе Macchi М7, Macchi М17 и полутораплана Savoia S.51. Летая в команде, три итальянских пилота использовали тактику блокирования противника, особенно в местах поворота на маршруте, чтобы не дать Биарду улучшить его среднюю скорость (241 км/ч) на первом круге. Биард был вынужден приближаться сзади к итальянцам и набирать высоту, чтобы обходить их сверху. Через семь кругов, несмотря на постоянное давление со стороны пилота S.51, Биард выиграл гонку с перевесом всего в две минуты. 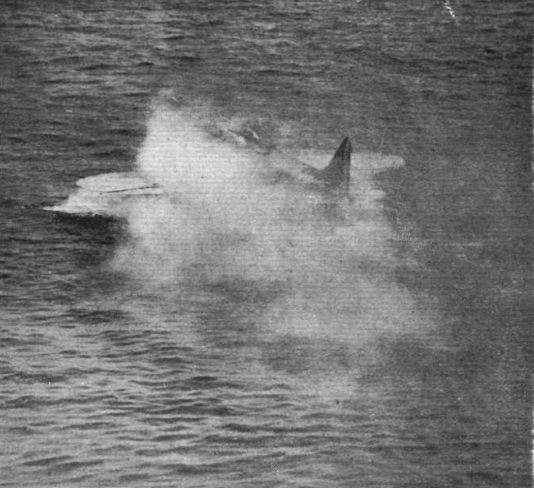 The Coupe Schneider: The winning Supermarine, "Sea Lion II," Napier "Lion" engine, at rest on the sea off Naples. THE FIFTH SCHNEIDER CUP CONTEST, 1921: Italy, once again, won the trophy, at Venice, when Briganti averaged 178-5 k.p.h. (111 m.p.h.) on the Macchi VII flying-boat (200 h.p. Isotta). 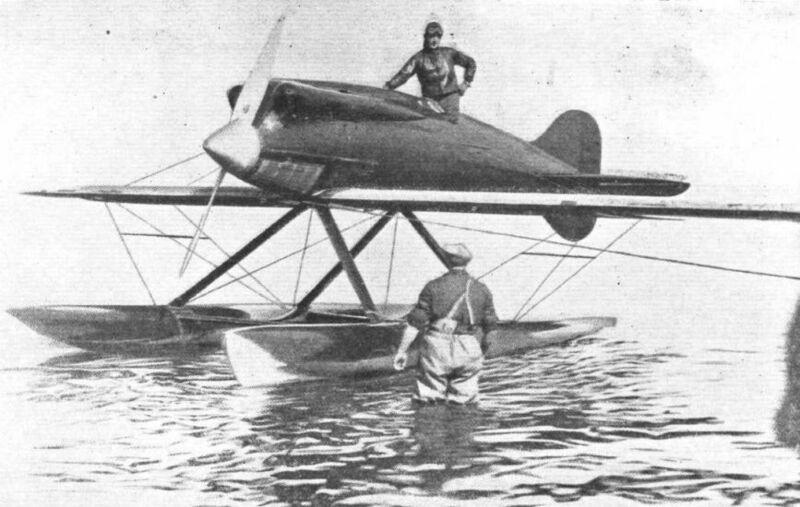 THE COUPE SCHNEIDER: One of the Italian Macchi flying boats. A representative of this firm secured second place in the race. 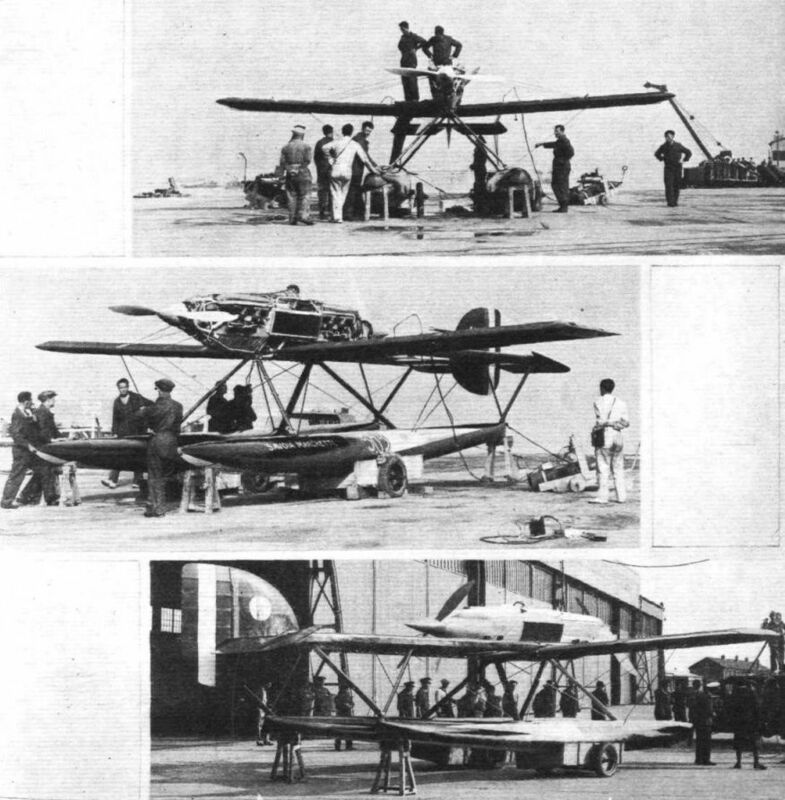 Three views of the all-metal Ford Commercial Monoplane, which recently carried out demonstrations at Croydon. This machine, which was exhibited at the Olympia Aero Show, has three 425 h.p, Pratt and Whitney "Wasp" engines. 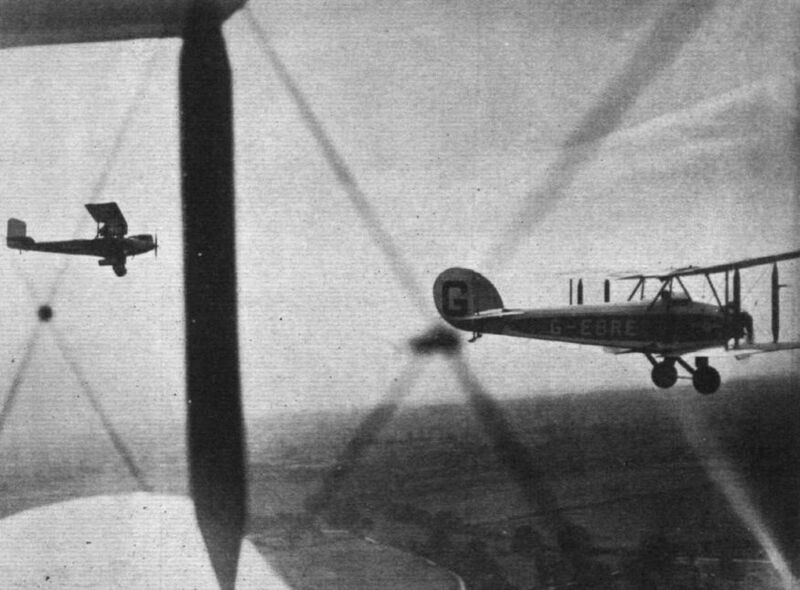 HADLEIGH AERODROME FROM THE AIR: The Club's Bluebirds in formation. Говард Пикстон сидит на одном из двух поплавков своего гоночного Tabloid. Самолет был самым маленьким и маломощным из участников Кубка Шнейдера в 1914 году. Но он оказался скоростным, маневренным и приятным в управлении. 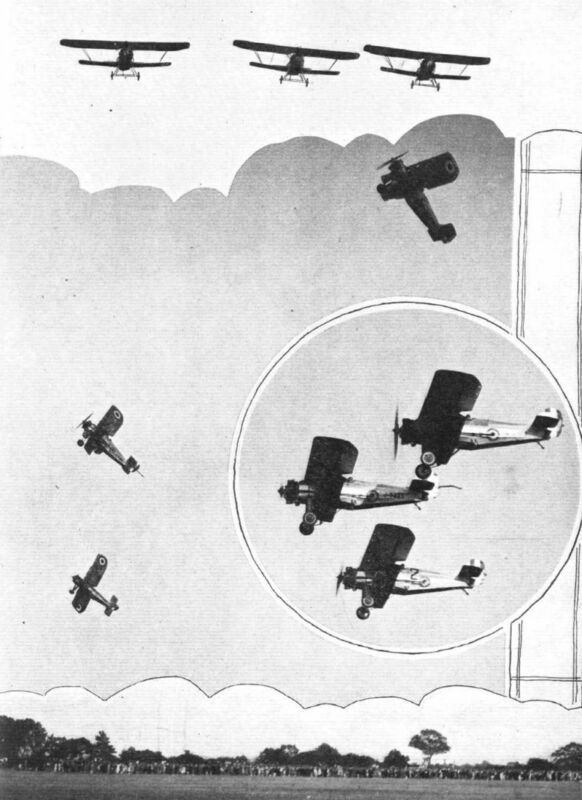 Sopwith Sea Scout (100 h.p. Gnome Engine). Average Speed 86.8 m.p.h. 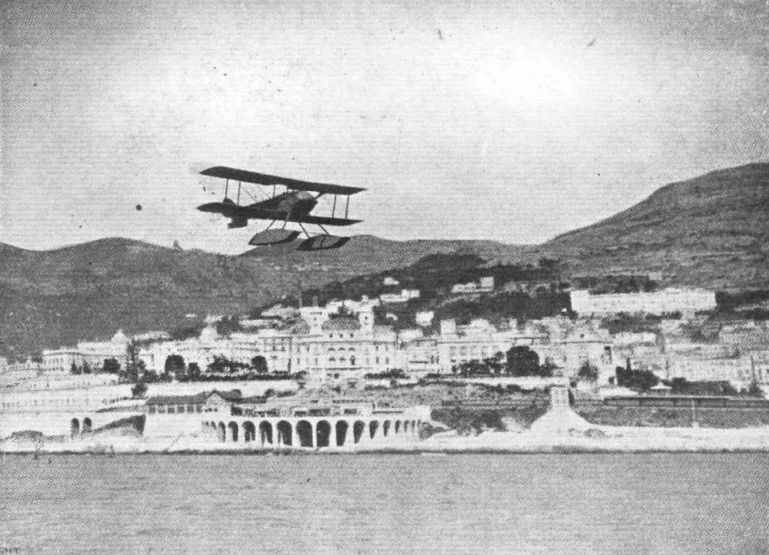 Winner at Monaco 1914. 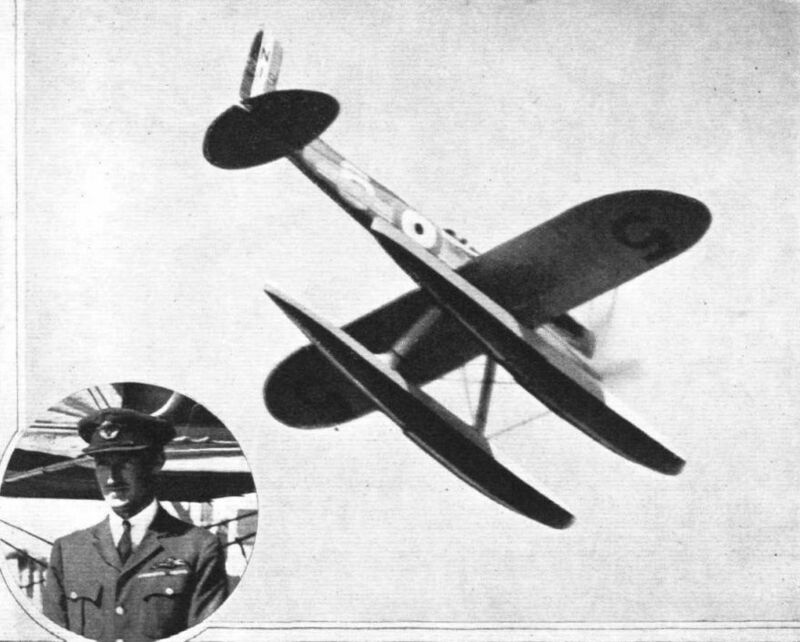 THE SOPWITH BIPLANE, PILOTED BY HOWARD PIXTON, WINNING THE SECOND SCHNEIDER TROPHY CONTEST FOR GREAT BRITAIN. HIS AVERAGE SPEED FOR THE COURSE WAS 86-6 M.P.H. 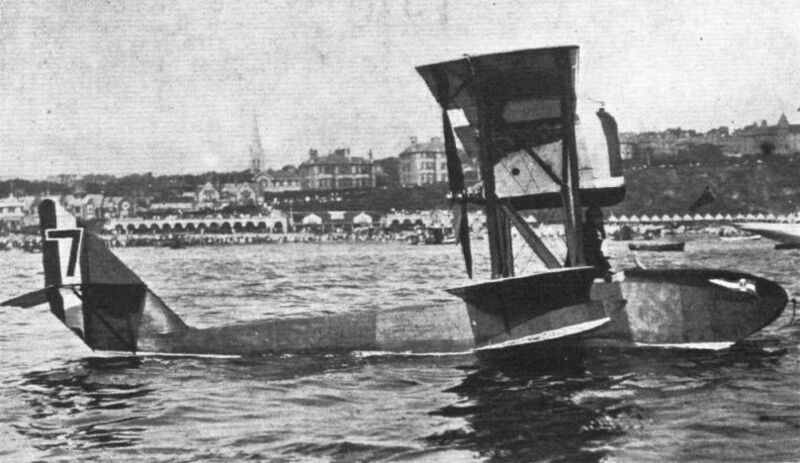 THE THIRD SCHNEIDER CUP CONTEST, 1919: This contest, held at Bournemouth, was annulled, as Janello's Savoia, which alone completed the full course, was not observed on one of the mark boats. 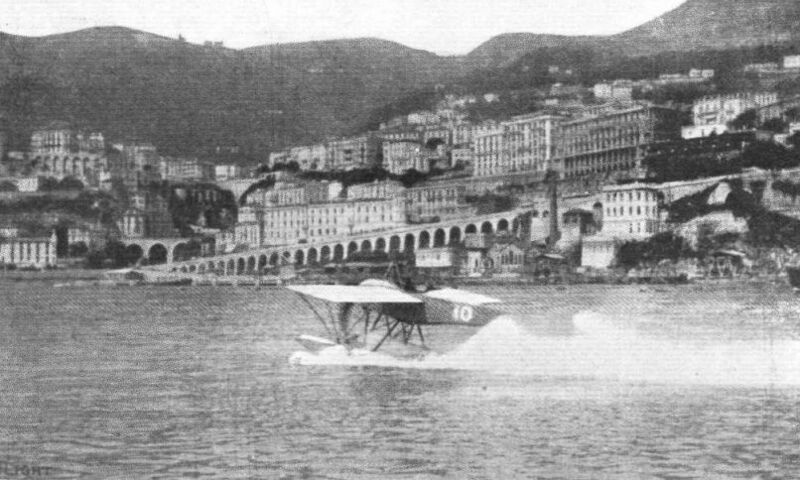 ALMOST A VICTOR: Sr. Janello, the italian representative (inset), and his Savoia S.13 flying-boat passing the committee yacht on his fourth lap. He completed the full course, in spite of fog, but was not observed at Swanage, so the contest was annulled. 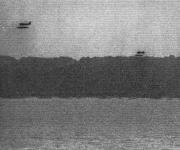 In the photograph the "Calcutta" is seen taxying on the River Medway, with a remarkable absence of spray. On the photo may be seen in and on the machine M. de Fleuriau, Mr. Mayer, of Shorts, Mr. Oswald Short, Lieut. Sala, and Mr. Mayer, of the Bristol Co. 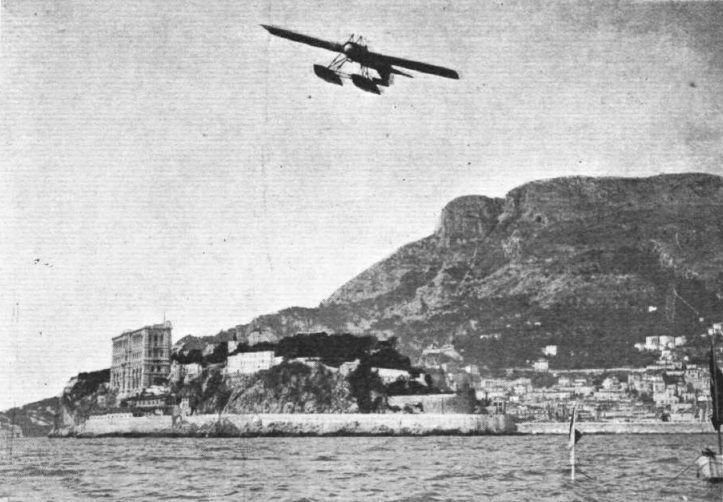 THE FIRST SCHNEIDER CUP CONTEST, 1913: The French pilot Prevost winning the contest at Monaco on the Deperdussin monoplane, 160 h.p. Gnome. His speed was 72-6 k.p.h. (45-75 m.p.h.). 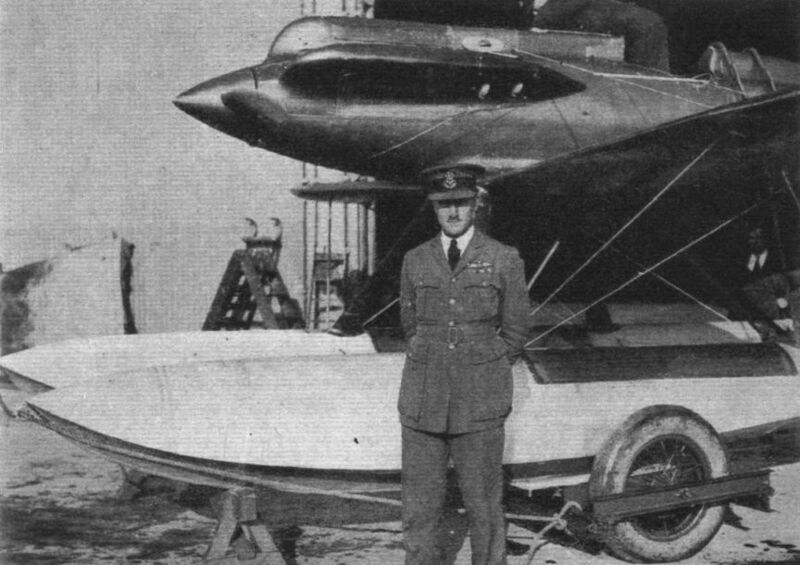 Flight-Lieutenant Stainforth in front of the Gloster-Napier VI on which he established a world's speed record of 336-3 m.p.h. 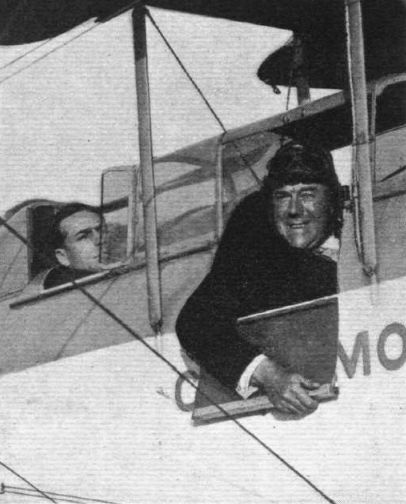 Mr. L. E. R. Bellairs, of the Southern Aero Club and Southern Aircraft Co., in the new single-seater biplane, the "Martlet," built by the company and fitted with an A.B.C. 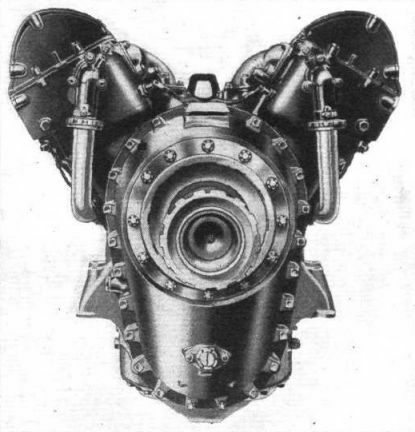 "Hornet" engine. It has remarkable manoeuvrability, lands in an extremely short distance, and shows exceptional steadiness on the ground. FROM ARGENTINA: It will be remembered that the Fairey Aviation Co., Ltd., built a batch of Fairey III.F. 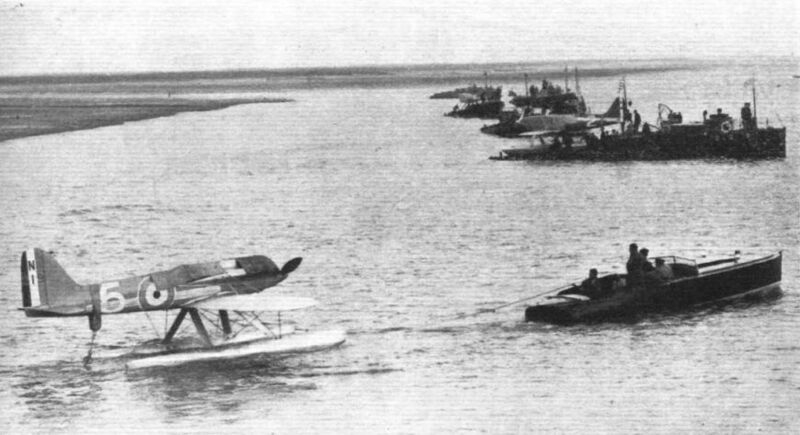 seaplanes for the Argentine Navy a little while back. This photos, recently received from Argentina, show one of these machines operating from one of the Argentine Navy air bases. 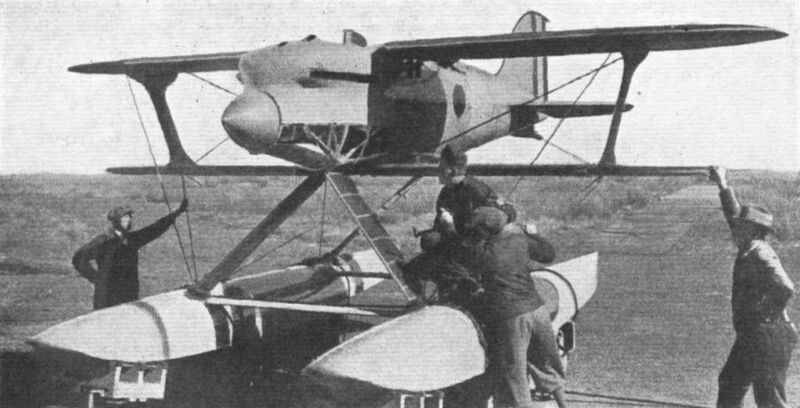 Flying-Boat used by the C.A.F.C. at the Point-aux-Trembles base: one of the Schreck F.B.A.'s. ITALY'S FASTEST CHALLENGER? 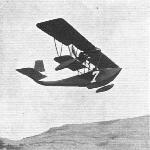 : The little Fiat monoplane, with Fiat engine, is reported to be extremely fast, but to have a very high take-off speed. THE BUSINESS END OF THE FIAT RACER: An Italian engineer working on the Fiat engine, which a 12-cylinder vee type. PART OF THE N.F.S. 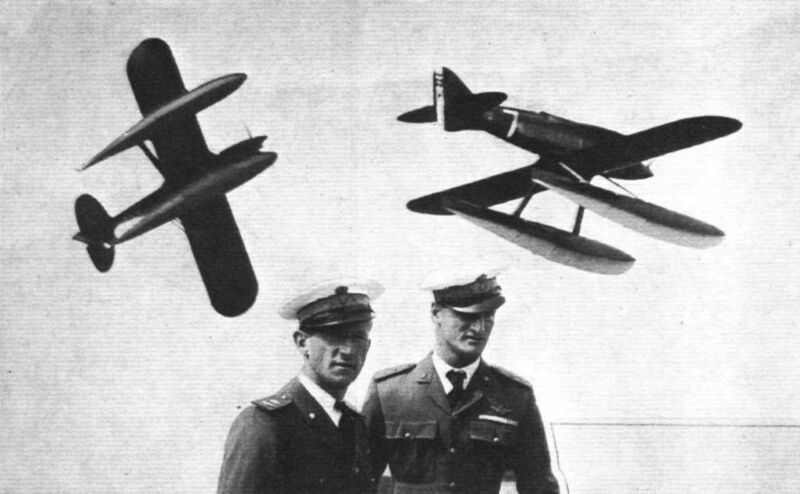 FLEET: Mr. Marcel Desoutter by the tail of his first machine discusses the Martlet with a friend. 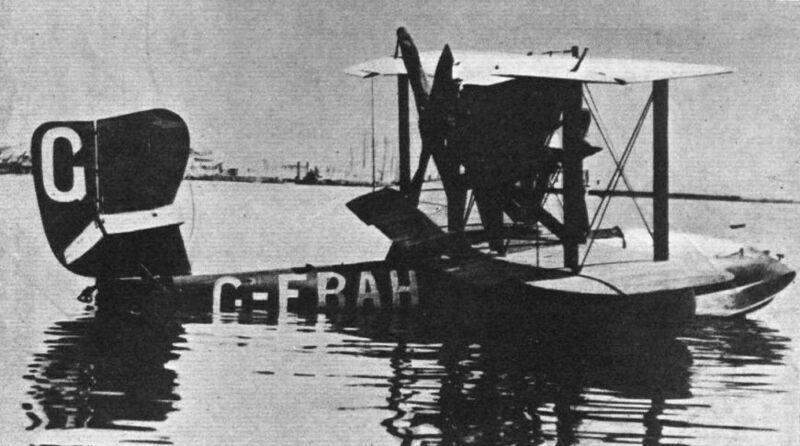 A BRITISH VISITOR AT LA BAULE: Air Vice-Marshal Sir Sefton Brancker flew to La Baule in the Saunders "Cutty Sark" flying boat (two "Cirrus" Hermes engines) seen here after arriving from England. When I was a very young man I took this photograph of 'Al' Williams in the cockpit of the 1929 Mercury-Packard racer which was groomed for the Schneider Trophy Race of that year but never took part. 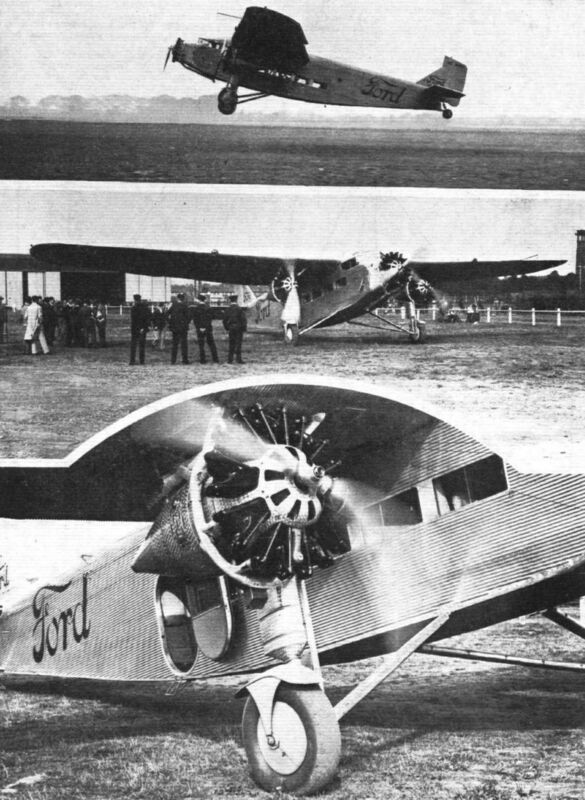 The engine was a 1,250-h.p. Packard 'X' inline. 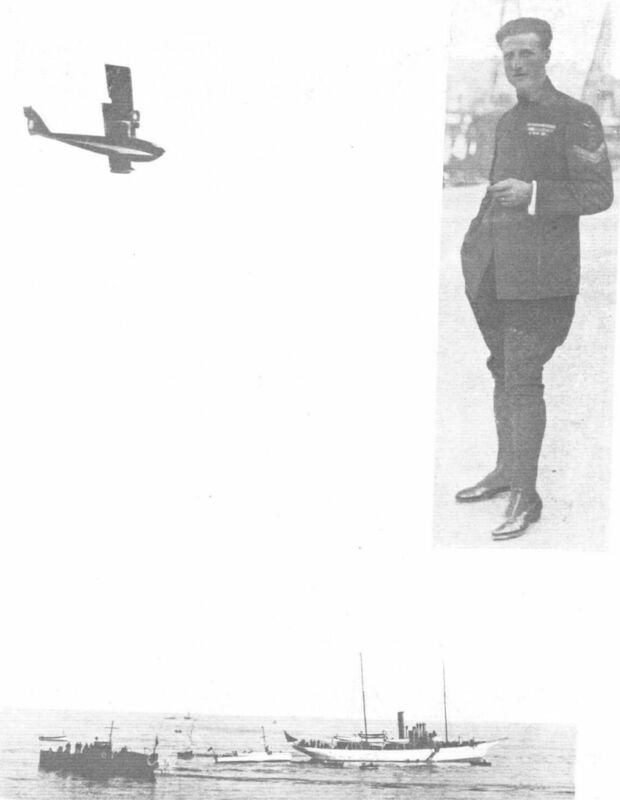 That was the year Major (then Lt. U.S. Army Air Corps) 'Al' J. Williams was awarded the Distinguished Flying Cross for his experimental inverted flight tests carried out in March 1928. 'Al' was a great pilot and flawless aerobatist, and it is sad to record that he passed away a short while back, while still very much in the prime of life, at the farm near New Bern, North Carolina, to which he had retired. 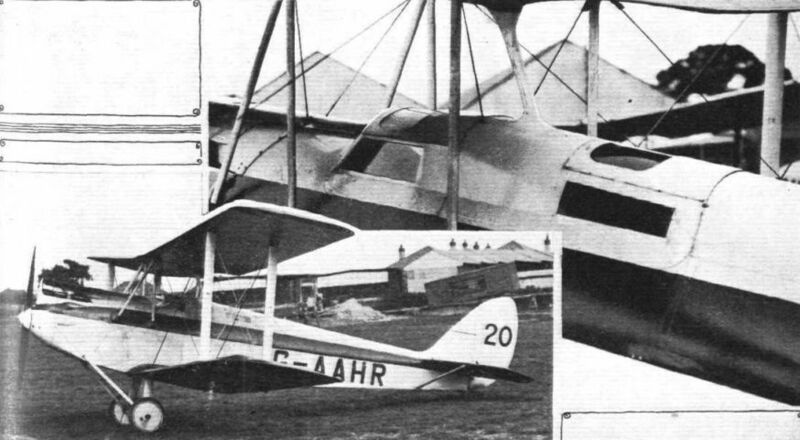 'Al' is perhaps best known to your readers as the pilot of the famous series of orange-and-blue Gulfhawks which were a feature of so many pre-war air displays. 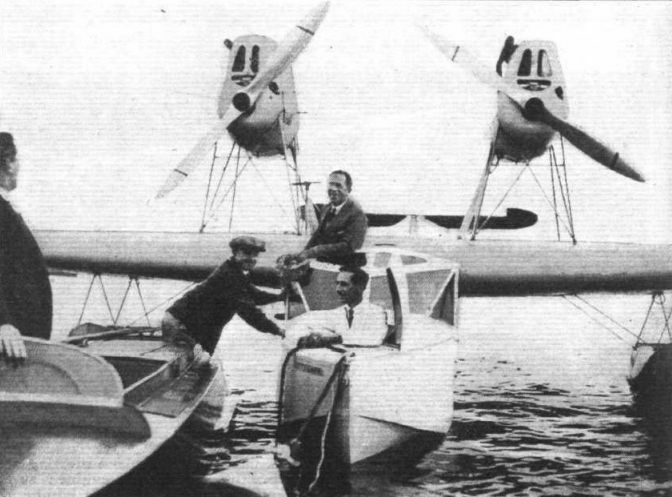 LA BAULE: The Bleriot 195 seaplane, with four 250 h.p. Hispano-Suiza engines, which was withdrawn from the Rallye and did not start. 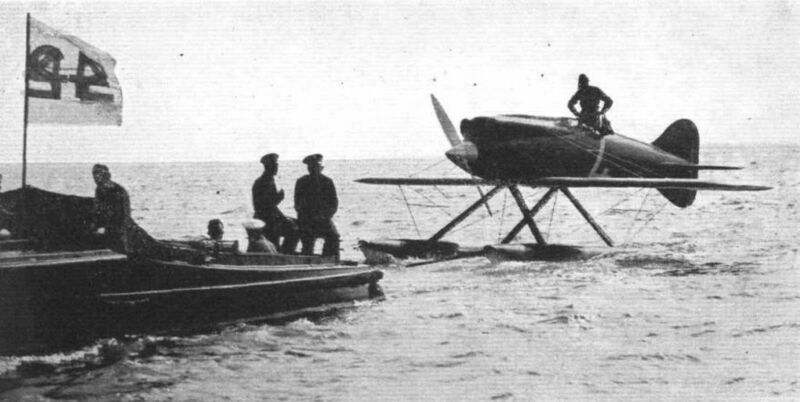 THE SCHNEIDER CUP RACE: De Briganti leaves the slipway in the Macchi M.33. Note how deep the machine is in the water. 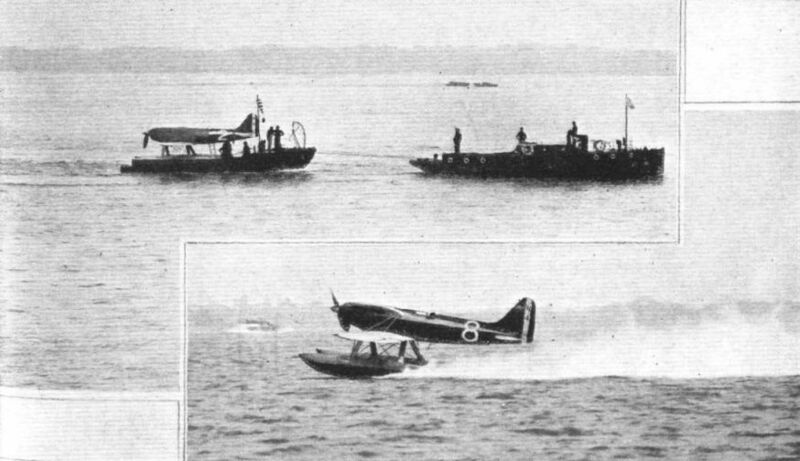 When outboard engines score: A Supermarine "Southampton" flying-boat, about to take members of the Italian Schneider Team over the course, is called upon to do some manoeuvring on the water to avoid the Cowes-Southampton steamer and a yawl off Calshot. 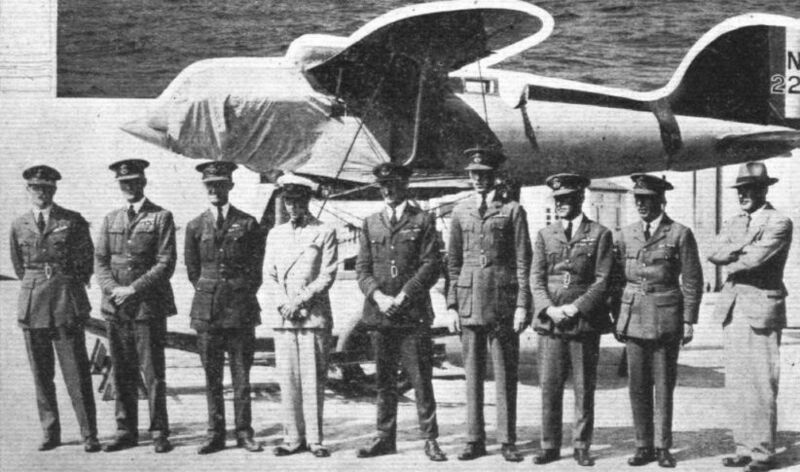 THE PRINCE WITH THE SCHNEIDER TEAMS: Just taking off on board a Supermarine "Southampton" for a flight over the Schneider course. 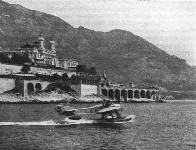 The Prince will probably watch the Contest from Sir Henry Segrave's speed boat "White Cloud." The new long-span Simmonds Spartan with the new car-type engine cowling. The One-Man Show - an owner, designer, constructor, pilot. Fl. Off. J. Clarke, and the result of his labours, the Cheetah (30 h.p. Thrush). 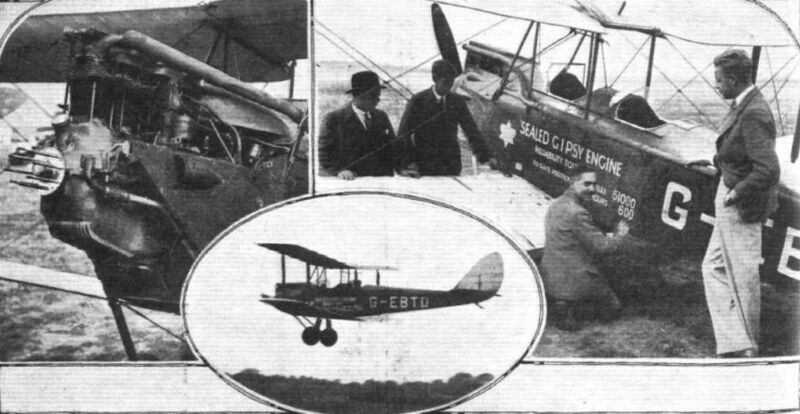 THE ZENITH CUP WINNER: The De Havilland "Gipsy-Moth" on which recently Capt. Broad won the Zenith Cup Circuit of France in a day, at an average speed of about 112 m.p.h., is actually the machine flown by Broad in this year's King's Cup race. The cowling arrangements are a little unusual, and are designed to reduce air resistance. HALDON'S WEATHER! The clouds and the picketed machines show a little of what they had to contend with at Haldon. 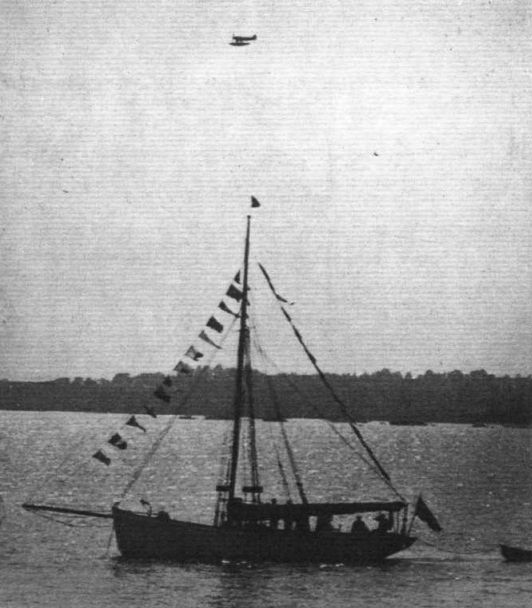 The Under-Secretary leaves for London in the DH Gipsy Moth piloted by Mr. P. P. Grey. Miss E. I. 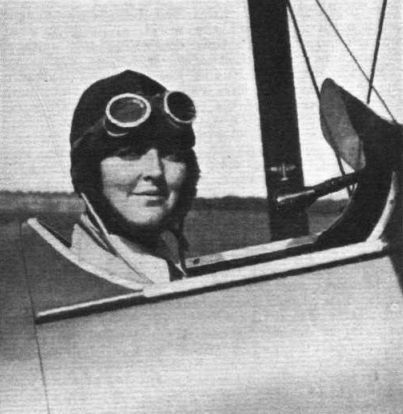 (Susan) Slade, to whom aviation is a pastime and a profession, for she is the private owner-pilot of a D.H. "Moth," and also holds the position of secretary to Airwork, Ltd., of Heston Air Park. 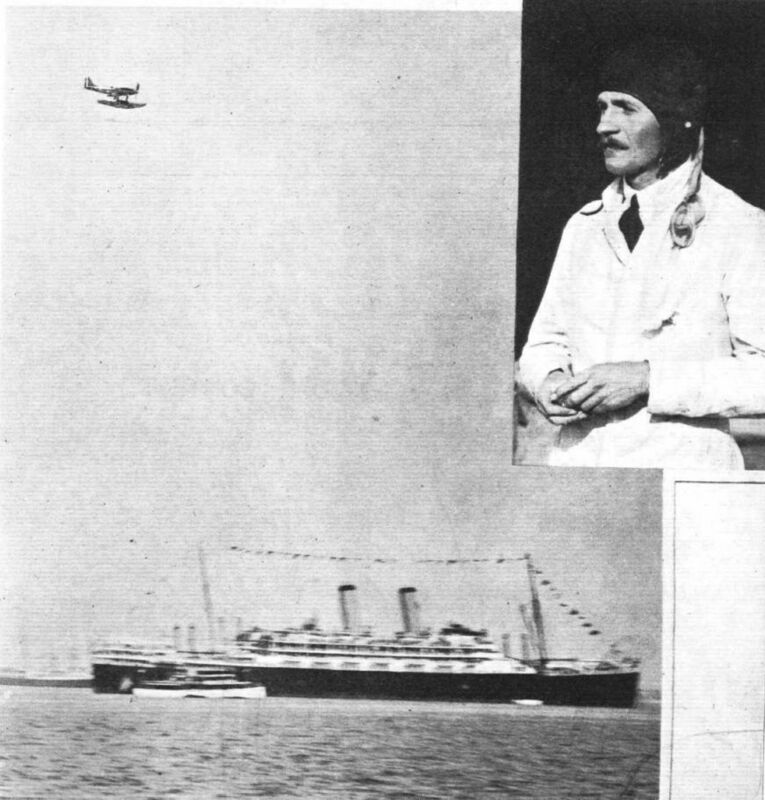 Amphibious Visitors to Calshot: Captain H. Broad, with Vicomte de Sibour as passenger, looks in on the Schneider Teams. "International Visitors": Comte Arnold de Looz Corswarem and Mons. 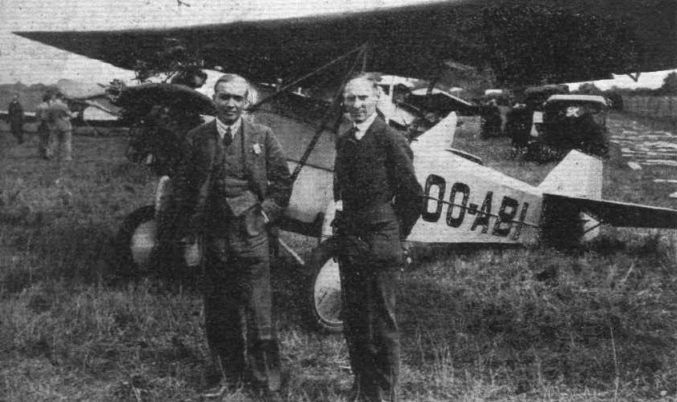 Maus, his pilot, with their St. Hubert monoplane (85-h.p. Walter) just before their return to Brussels. Not a likely starter, but a very interesting machine. 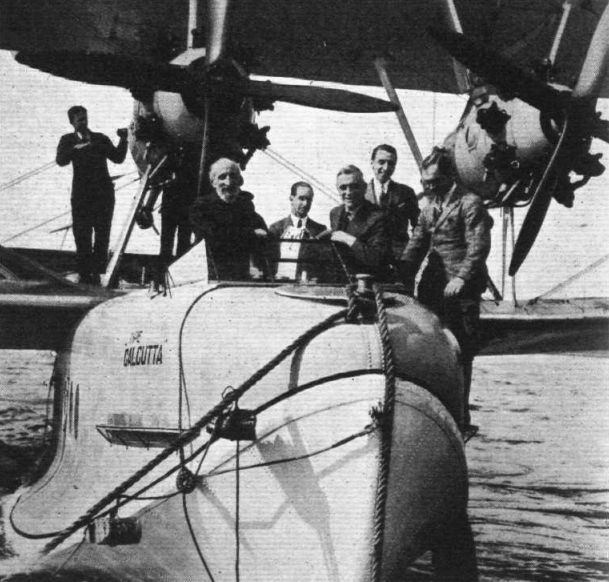 The Savoia-Marchetti S.65 has two Isotta-Fraschini engines in tandem, the pilot sitting between them. AS YET UNTRIED, BUT A PROMISING EXPERIMENT: The Savoia-Marchetti S.65 has its engines in tandem, with the pilot placed between them. It appears likely that this type may be developed into a very useful speed machine. A 1913 COMPETITOR. THE BOREL MONOPLANE, FITTED ,WITH A 100 H.P. 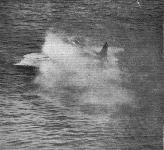 GNOME, AND PILOTED BY M. CHEMET, WAS UNFORTUNATELY ELIMINATED IN THE PRELIMINARY TESTS.